Undergraduate degrees in Mathematics (Yale, 1969) and Physics (Merton, Oxford, 1971). Doctorate in Astronomy and Astrophysics (Yale, 1976). Researcher at Harvard (1975-1985) and Goddard Institute for Space Studies (1985-1992). Program manager at NASA HQ (1987-1992). Adjunct Professor in Applied Physics and Nuclear Engineering at Columbia U (1986-1992). Professor of Earth System Science at UC Irvine (1992-present), Fred Kavli Endowed Chair (2002-2013). Jefferson Science Fellow at U.S. Deparment of State / INR (resident 2005-2006, as consultant -2010). Fellow of the AGU (1997) and AAAS (2004). UCI Lauds & Laurels Faculty Award 2008. Editor-in-Chief of Geophysical Research Letters (1997-2001). UNEP/WMO Ozone Assessments: Lead Author/Author/Co-Author in 1985, 1988, 1989, 1991, 1994, 2014, and 2018. Intergovernmental Panel on Climate Change: Reviewer; 1992; Convening Lead Author, 1994, 1995, 1999 and 2001; Lead Author, 2007, 2013, 2014; Scoping, 2017; Review Editor, 2022. 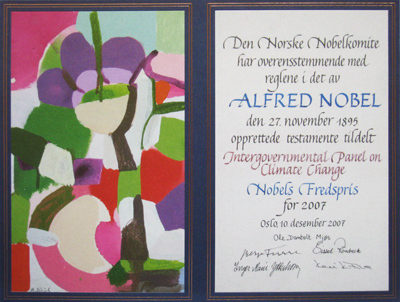 The sustained, collective work of the IPCC since 1988 was awarded the Nobel Peace Prize in 2007. Congrats to all my colleagues who worked on these assessment reports, and helped save the planet, one chapter at a time.